In the series of Generic Object Services(GOS) available in the SAP, we have discussed different usage of the GOS toolbar. You can find all of these discussions at Tutorials > Generic Object Services (GOS). Today, we’ll see the another concept: Relationship browser. Relationships option is available in the GOS Toolbar at GOS toolbar > Relationships. This browser could display different linked objects like Sales Documents, Inbound IDOCs, Outbound IDOcs etc. 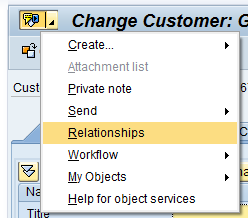 Now lets see how to add this Relationships in this relationship browser. For this purpose, we can use method CREATE_LINK of the class CL_BINARY_RELATION or the FM BINARY_RELATION_CREATE. Method CREATE_LINK is an advanced version to create the Link which would be displayed in the Relationship browser. Since the method CREATE_LINK is an improved version to create the links, it doesn’t support all the object models. For the remaining of the object models, we need to use the FM BINARY_RELATION_CREATE. So, the question is how to know when to use FM. When the relation model is not supported by the method CREATE_LINK, it raises the exception CX_OBL_MODEL_ERROR. So, we’ll call the method CREATE_LINK inside the TRY … CATCH … ENDTRY block. This Code Snippet shows how to use the method to create links in the relationship browser. ty_t_related TYPE STANDARD TABLE OF ty_related. FIELD-SYMBOLS: <lfs_relat> LIKE LINE OF me->t_related. APPEND INITIAL LINE TO me->t_related ASSIGNING <lfs_relat>. LOOP AT me->t_related ASSIGNING <lfs_relat>. WRITE: / 'Relation added: ', <lfs_relat>-instid(10), <lfs_relat>-relation. DATA: o_relation TYPE REF TO lcl_relation. After successful program run, it will display the relationship in the browser of the Order.